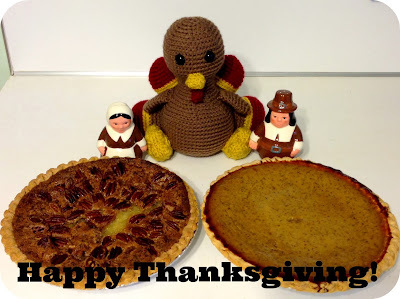 Show and Tell Meg: Happy Thanksgiving! To all my friends in the US of A, I hope you are having a very Happy Thanksgiving! I've been cooking pies like a crazy person last night and tonight. Above is my Great Grandmother's recipe for pecan pie and then there is a classic pumpkin pie next to it. I've also made a cherry pie and a new variation of chess pie as well as cranberry relish and I'm about to make fresh whipped cream :) Alvin the Turkey up there is very excited to come around to the 2 meals we have to attend today (my husband and I live between our parents' houses, so we go to both each year). Enjoy your family and friends today wherever you are! Eat lots of delicious food and be thankful for what you have :) I am extremely grateful that there are actually people out there that read my little blog! You make my little outlet possible and I wish you all a Happy Thanksgiving!